Finally…Something On Diet And Nutrition. It has been a long-time since I mentioned this subject. My goal over the coming weeks is to get back into more general health and fitness writing, rather than just being focused on the back rehabilitation alone. With that in mind, a great article came my way this week that has rustled more than a few jimmies in the “fitness community”. The more experience I have, the more I see that fitness and nutrition has replaced religion for some people. Everyone like to nail their flag to the mast of one guru or one approach over another. The result is that it is extremely hard to find reliable and unbiased information on social media and the internet at large. So when this article came along, the resulting chaos from triggered diet zealots was no real surprise. 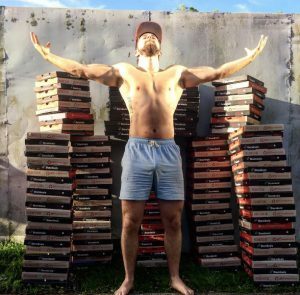 The tl;dr of it is a journalist, who already trains regularly and hard, challenges himself to fit in a large pepperoni pizza everyday (1600 calories) into his diet (with a 4000 calorie per day target). The outcome was no real surprise, he didn’t exactly achieve a ripped physique, but he didn’t die and his strength still improved. The surprise for me was that his blood work actually improved – I would have bet on at least a small increase in cholesterol or blood pressure with all that salt and fat. But then again, the most single most important factor in a diet is to consistently eat the right amount of calories. Eat less than you need to lose weight, eat more than you need to put on weight. “The moral of the story here isn’t that you should eat a pizza every day. It’s that so long as you get your nutrient dense food in and get your calories right, you can be very healthy and eat all kinds of junk.